Residents in a sleepy Mexican town fear that a new volcano is bubbling under the ground after an eruption of gas and smoke emerged from a field, local media reported. Cracks have appeared on the ground in Pueblo Viejo in the southern state of Michoacan, with temperatures of some 250 degrees registered in the subsoil. Local residents gathered at the site with preliminary investigations revealing that the cause of the eruption was geothermal activity from an underground swamp. Smoke has been rising from the ground since Sunday and local authorities have set up a security cordon to stop residents from getting close and possibly getting burnt by the high temperatures. Although experts have reassured residents that a volcano will not form, residents remain sceptical. According to reports, there are over 3,000 volcanoes in Mexico but some 45 of them are considered active. Someone suggested geothermal activity in the ground on a soccer field in Michoacan might be the precursor to a volcano, but officials say it's unlikely. Steam emissions and a couple of burned goats yesterday in Pueblo Viejo, a community in Venustiano Carranza, stoked concerns that a volcano was forming. 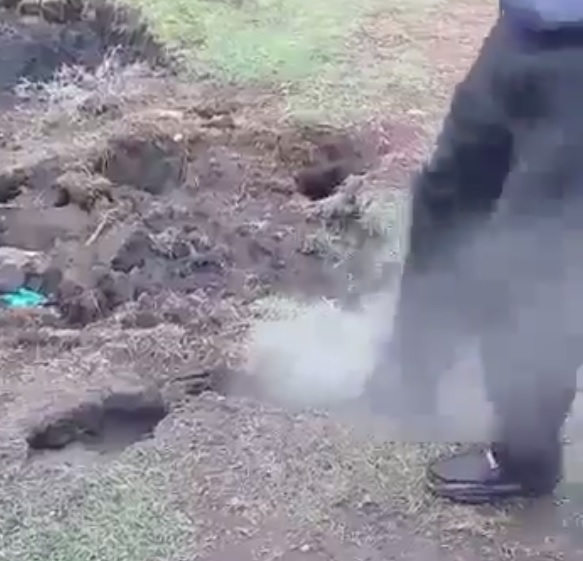 And although Civil Protection officials said they found ash inside cracks in the ground, they couldn't say it was linked to volcanic activity. Incandescent material has also been spotted within the cracks, and temperatures of 250 C have been recorded below the surface of the ground. Experts from the National Autonomous University are now investigating. "We cannot say that this is the birth of a volcano because until now there has been no earth movement in the area, which tells us it can almost be ruled out," said state Civil Protection coordinator Pedro Carlos Mandujano. However, he added, authorities will await the results of the investigation, which could come within the next few hours. Residents have been advised there is no danger although soldiers have been deployed to the field to seal it from public access.